Once A Week Vegan: When Is Milk Not Milk? We are FIVE friends committed to eating vegan one day a week. We invite you to join us, find a recipe or two here to get you started and share your vegan day experience with us. 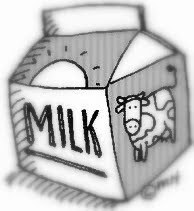 What comes into your mind when you hear the word "milk?" I bet it's the same thing everyone on planet earth thinks. That white stuff from a cow or a goat. Maybe even a sheep. If you're from my generation, visions of hand milking the cow and aiming the stream of white stuff toward the metal pail is what comes to mind. Most likely, you recall drinking that milk from that bucket, still warm from the cow and full of cream. Probably the younger generation envisions dozens of commercials with a famous person wearing a milk mustache. And right behind that comes the sensory recall of those gallon bottles from the grocery store, so heavy only an older child or adult can lift them. Considering that I am in no way a scientist, I won't record why animal milk is supposedly bad for us. I've read reports--mostly conflicting--and since I have to way of sorting truth from error I leave it to those with initials after their names to write their findings. Besides, I was never good in science, generally pulling up a "C" where those mysteries of the universe were concerned. Even today, decades later, I still don't publish as truth what I've read in one place or another. I learned long ago that most scientists never agree on anything. Because "animal" milk is a no-no in our vegan world, I thought it would be fun to examine those non-dairy products we use as replacements. I've tried them all. Are they as refreshing as real milk? Not by a long shot. Do I like them? For the most part, no I don't. Do I use them? You bet. My first go-around was with soy milk. I'm being honest here. I didn't like it. Not one tiny bit. 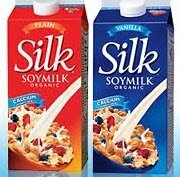 My son suggested I try the soy milk he used all the time but I didn't care for that version either. Still, I used it in my dedication to becoming vegan. Even so, I discovered that soy milk is naturally free of saturated fat and cholesterol because it is made from plant material. Personally, I think I'd rather eat the plants, but that's another story. 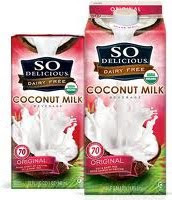 It so happened that there came a day when I was at the grocery store to pick up more--you guessed it--soy milk when I discovered coconut milk sitting on the dairy shelf. I love coconut. I figured this would be a good substitute for the soy, so I brought a half gallon home. It was quite tasty in my morning coffee, but to just sit down and drink a glass of coconut milk wasn't on the top of my "to do" list. Now I understand that many people around the world consider it to be a miracle food because it helps protect the body by building up the immune system, along with the body's natural defenses. And even though coconut milk contains a bunch of vitamins and minerals and even electrolytes, the only reason I used up the half gallon was because it tasted real good on my morning oatmeal. 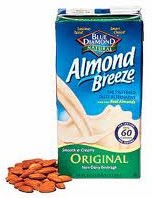 A couple months passed before I realized that almond milk had a place in the dairy aisle. Considering that I adore almonds in any form, I happily picked up a half gallon to give it a try. It was absolutely delicious in my "Is it morning already?" coffee. I tried drinking a glass of the stuff. My palette screamed at me. So despite the almond milk being low in calories and fat and high in vitamins and calcium, the only thing I used it for besides my coffee was my oatmeal. It was doggone good on the oatmeal. A friend suggested I give rice milk a try. I found it to taste similar to skim milk and a little on the sweet side, but not grossly so. I could actually drink a small glass of rice milk if I wanted and not gag over the taste. It was my go-to non dairy milk for months. And months. It is low in cholesterol, has a trace of protein, a goodly number of vitamins and is low in calories. I was happy with the product. And then came the FDA report that the rice we use is contaminated with arsenic. A bit too much arsenic. And while they try to figure out where the dangerous chemical is coming from, they continue to let us eat and drink the stuff. Not me. Goodbye rice milk. I figured I'd switch back to soy or coconut or almond since I had no other choices. Then two weeks ago as I made a quick loop through my local Farmer's Market, I spied something called Flax Milk. Truthfully, I know little about the flax seed other than that the canister of glossy brown seeds in my refrigerator has been there at least two years and never been opened because I could never figure out what to do with them. Yet the flax milk intrigued me. The container told me flax can be eaten whole or ground or as an oil and was full of protein, fiber, and Omega-3 fatty acids. I learned that just 2 tablespoons of flaxseed contains nearly 200% of our required daily dose of Omega- 3. Besides all that, flaxseed helps the brain and boosts immunity. But what I loved the most about it is that it is good enough that I don't want to toss my cookies after drinking it. I use it on my cereal. My coffee. In baking. And in sauces for my entree of the evening. I use it for everything and am happy with the results. So if I consume it regularly and it really does boost my brain power, there may still come a day when I have some sort of initials after my name. Science initials. Oh, give me a break. Yah, like that's ever going to happen.